Does McDonald’s sell real food? How come the food doesn’t rot? Do the nuggets have real chicken in them? Is there pink slime in the beef? Are the hamburgers really 100% beef? Would you feed your food to your own family? We have all been asking (and wondering) these questions. Now, the mega-fast food brand is pretending to answer us. In their most recent campaign, it seems McDonald’s has decided to address the ongoing concerns with their food processing centers and cloaked handling of food sources. So, to mitigate concerns from their patrons, they teamed up with Grant Imahara, television personality, fellow USC Trojan alumni, and host on the popular show “Mythbusters,” to answer some of the most probing questions from fans and critics alike. How does one send in questions? Well, you can simply go to their Twitter page. They have a database dedicated to answering all the questions they are getting. Some responses are simple text. 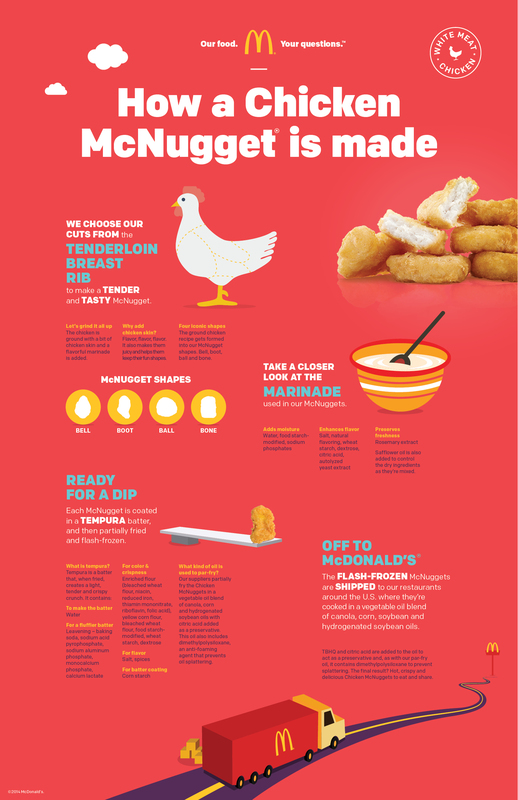 Some have illustrations like this gross chicken nugget infographic. And the most important burning questions get full-blown video responses. Luckily for you, I have compiled a few of their videos below (with my own flavorful commentary of course). See, all we have to do is get a “burger expert” – aka a guy who looks official – to explain to us how a freezer works. Somehow, Mr. Manoah Crane thinks the answer to why McDonald’s freezes its meat is “because the flash freezing process.” Nope. That’s the wrong answer. McDonald’s freezes it’s meat because they don’t want to invest in fresh (never frozen) patties which require more storage space, actual inventory planning, real cooking, and overall concern for the health of those consuming them. Got it? Okay. Next question. Their answer? They use “beef trimmings.” I’m not sure what cut that is but it isn’t slime so…yay? They confirm the beef is real here but neglect to mention that their procurement processes are a) incredibly harmful to the environment, and b) less like a kitchen and more like an elaborate manufacturing center. Wait. I guess that was the point. Next question. Well, let me tellya, you’re lying. McDonald’s meat isn’t cheap simply because they “buy in bulk.” They also skimp on freshness and care by handing the entire procurement process over to Cargill. But, the real reason why the food is so cheap at the mega-chain is even simpler than that: they don’t pay a living wage. I wrote about this quite some time ago. McDonald’s continues to pay large dividends to high-powered executives while limiting economic growth for its lower level employees. They even tell their own employees not to eat the food. When confronted with all the bad press – like last year when McDonald’s built a website telling employees to get second jobs and not turn their heat on to save money (since removed) – CEO Don Thompson (who made $9.5 million last year) finally came out in support of an increase in the minimum wage. Here’s the thing though, they are not saying they will support a bill if it passes Congress – which we know it won’t because it is on perpetual vacation. Could they just raise the wages within their company? Certainly. Will they? Nope. When people are questioning whether or not your food is real, you have obviously failed somewhere. The mere fact that these types of questions are being raised points to a much larger issue for the company. By enacting this new campaign, they are attempting to humanize a process which embodies all of the worst aspects of food technology today. And, they do it while screwing over working class Americans. McDonald’s can miss me with this new campaign. This is just the emperor’s new clothes of fast food. Nothing has changed and without sufficient pressure from public actors, nothing will change. But they sure are trying it right now.